Having a personal attack alarm close at hand can give you peace of mind in any situation where you might feel unsafe. Although statistically the risk of being a victim of violent crime within the UK is relatively low, you should never take your safety for granted. Carrying a personal attack alarm is a cost effective way to deter a potential attacker by emiting a very loud, piercing siren designed to disorientate and shock giving you vital seconds to move to safety as well as alerting passers by to your predicament. The Protector Mini is compact and easy to use. It can be worn around the neck, put onto a keyring or kept in a handbag and clipped to the strap making it easy to locate. 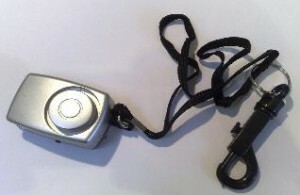 It has easy pull cord action, and a small light. In the opinion of The Suzy Lamplugh Trust, the siren should emit at 130db, The Protector Mini’s siren is 140db! In addition, this unit can be adapted for use as an alarm on doors and windows. Our price £4.99 inc vat plus .75p postage & packing (Royal Mail 2nd class) within the UK. 10 or more purchased, no delivery charge! Call 020 8502 2327 to place your order!